Scarcely had a defense motion to disqualify a judge been denied before that judge turned 'round and granted another defense motion – "a ruling that throws the future of the trial into question." 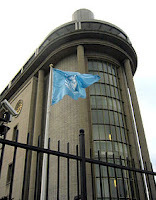 The decision today came amid opening arguments, and just 2 days after ICTY President Theodor Meron denied a motion to disqualify Orie from the case. It reflects a recurring problem in international criminal adjudication, a fact rather painfully reflected in the AP sidebar entitled "Glance of delayed international war crimes cases." Time frames for a Mladić trial restart seem to run into many months. No small thing given that Mladić, who was indicted in 1995 and arrested in 2011, is 70 years old and not in the best of health.